One of the workshops underway at the 2018 Revenue Management Summit in Melbourne. Blockchain, discounting practices and influencing trends were among a variety of issues discussed and debated at the 2018 Revenue Management Summit, held recently in Melbourne and hosted by the Australian Revenue Management Association (ARMA). 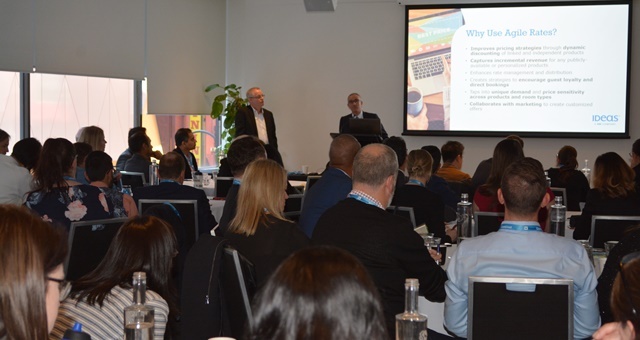 Around a dozen pertinent issues, concerns and success stories relating to revenue management were fielded, with ideas shared, feedback presented and significant buzz generated across a variety of workshops and panels over two days at the Rydges Melbourne. The 2018 edition highlighted the growing strength of the sector, receiving its highest attendance ever. ARMA’s founder Melissa Kalan said: “ I am delighted the Summit was so well received again by industry”. Held under the theme ‘Unite & Prosper’, the summit featured revenue managers from across the wider accommodation industry in the Asia Pacific as well as many major players in the wider travel industry including cruise lines such as P&O Cruises Australia, which provided the major prize for delegates. Delivering the keynote presentations were former Sydney Airport commercial manager Mark Bunting and Andrea Staines, founding CEO of Australian Airlines (mark II), former Qantas senior executive and current director of Tourism Australia. High on the agenda were topics such as Agile Rates, which focused on how hotels can do more to make their pricing more attractive and personable in line with marketing efforts. The conundrum that is Blockchain also made an appearance, with its looming impact on how it will change business in the short and long term discussed widely. Sales and marketing tactics and success stories were also a hot-button topic as negotiation tactics and objection handling were all covered. Delegates spoke on ‘when to walk away’ and making concerted efforts to build in value first before discounting. Revenue managers were reminded of the importance of understanding cost barriers, trimming expenses and innovative ways to be mindful of excessive and unnecessary spending in order to maximise cost savings without being overly frugal. Kalan added that, “some of the industry’s most successful and innovative marketing campaigns were also dissected,” including a ‘Pay What You Want’ campaign run by BIG 4 Great Lakes Holiday Park in August 2017. In a unique move, the property effectively turned over revenue responsibilities to its guests, allowing them to literally charge themselves what they considered to be a fair price for the cabins and sites, with no restrictions on length of stay or number of cabins. The campaign was exhaustively researched in advance and proved to be an interesting insight into guest behavioural psychology. Guest personalisation was also front and centre, as research shared with delegates conclusively showed the needs of customers and their eagerness to book anything on any device at any time, with mobile trends continuing to skyrocket. Booking by voice was highlighted as an emerging trend while attention was also given to the rise, yet volatility of cryptocurrencies. ARMA says the APAC Revenue Management Summit will return in 2019, with more details to be announced soon.